A disgruntled ex-gym employee shot two of his former co-workers in an Equinox gym before turning the gun on himself at a ritzy Florida shopping center. Abeku Wilson, 33, opened fire inside the Equinox Fitness Club in Coral Gables on Saturday afternoon. The gunman is believed to have been a disgruntled trainer who had recently been fired, the Miami Herald reports. 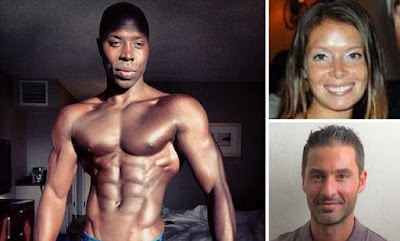 He had targeted the gym’s general manager Jeanine Ackerman and personal trainer Mario Hortis. Police say the ex-employee targeted the two victims after a managerial dispute at the luxury gym. A witness saw Ackerman on the floor unconscious and said Hortis was bleeding heavily but was conscious following the shooting. Wilson was found dead on the scene when authorities arrived. A helicopter from the Miami-Dade Fire Rescue landed on the field of Coral Gables Senior High School and transported the wounded to Jackson Memorial Hospital’s Ryder Trauma Center. Wilson was considered one of the most popular trainers at the gym, according to the Herald. He was usually clean shaven but some of the witnesses who saw him Saturday morning noted he looked disheveled. He was a fitness model who appeared in various print brochures. He was born in Boston and lives in Miami. One person at the gym told the Herald he knew the shooter and saw him moments before the shooting and didn’t seem to be acting abnormally. Witnesses at the nearby Soul Cycle heard several gunshots. A woman named Anais Michelle‏ tweeted she was at the mall at the time of the shooting and posted a video of people hiding in the storage room.Alvaro Zabaleta of the Miami-Dade Police Department says detectives have responded to the scene of the shooting in Coral Gables that resulted in one death. He told Local 10: ‘The scene is secure and no one is in danger at this time.’ Zabaleta says the location of the shooting was along South Lejeune Road.